I’m happy to announce the release of Dupin v2.14, which adds a couple of navigation features I found myself wanting. 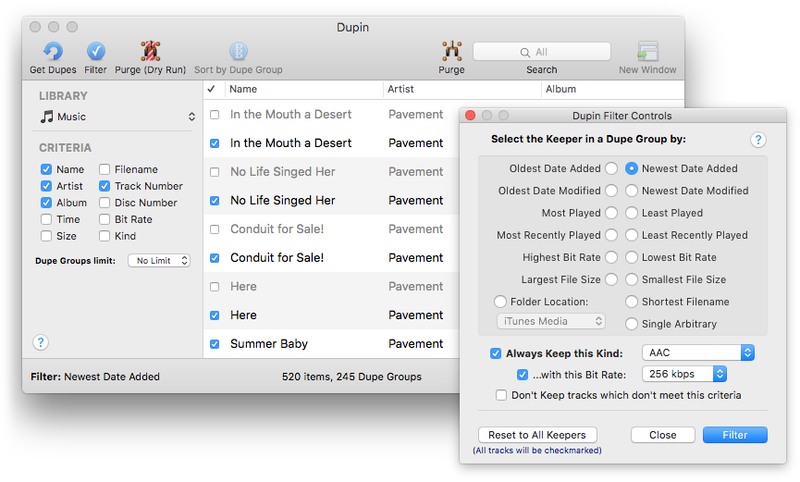 In case you don’t know, Dupin works with iTunes to discover, manage and even remove duplicate tracks and files. But Dupin allows you a way to establish exactly what properties of tracks make them duplicates and to choose which single track of a “Dupe Group” of tracks is the “Keeper” and which are the “non-Keeper(s)”. The latter Filtering can be done automatically or manually by scrolling through the Dupe Groups. Dupin is available to try in Demo Mode, whereby some features are limited. A registration code to unlock the Demo Mode is $15.00. Dupin turns eleven years old this year and wouldn’t have stayed alive so long without such a great group of users. So thanks!